What: The ICA presents the first U.S. survey of the internationally recognized artist, Mark Dion. Since the early 1990s, Dion has forged a unique, interdisciplinary practice by exploring and appropriating scientific methodologies. Often with an edge of irony, humor, and improvisation, Dion deconstructs both scientific and museum-based rituals of collecting and exhibiting objects by critically adopting them into his artistic practice. What: Contemporary works by Takashi Murakami, one of the most imaginative and important artists working today, are juxtaposed with treasures from the MFA’s renowned collection of Japanese art. The exhibition reveals how Murakami’s contemporary vision is richly inflected by a dynamic conversation with the historical past, framed by a creative dialogue with the great Japanese art historian, Professor Nobuo Tsuji. 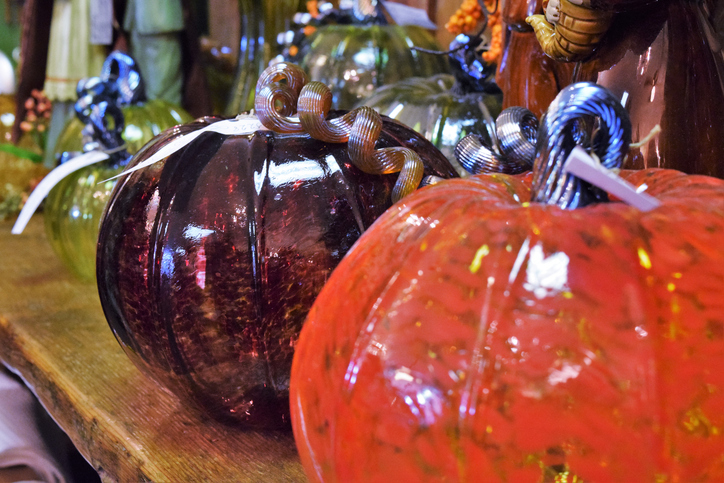 What: Diablo Glass School is offering a limited time 3-day workshop learning to make hollow glass pumpkins. This class will give the first time glass blower a strong introduction to creating sculptural class pieces in the hot glass studio. No experience necessary. What: Consisting of five works, all utilizing styrene cards arranged and affixed within custom display frames, Donovan’s “Compositions (Cards)” continues Donovan’s exploration of the balance between order and chaos, the individual and the collective, the minute and the sublime, as well as the possibilities of creativity with seemingly base materials. What: Join AIGA Boston and Boston University for HERSTORY, a lecture series part of AIGA’s Women Lead Initiative. Erin Robertson is an artist, fashion designer, and winner of Season 15 of Project Runway. Robertson will share insights on her collaborative and interdisciplinary design process with other multimedia artists. What: Happening every other winter, From Minimal to Bling is an exhibition of contemporary craft jewelry. This group show will display the medium’s hottest, up-and-coming artists. Whether you are new to craft jewelry or if you are a maker yourself, this exhibition is not to be missed. When: Opening Reception—Thursday November 9, 6:00 PM – 9:00 PM, open through February 3. What: Soak up the enchanting atmosphere of the Museum at night. This lively, social evening features music, creative collaborators, a cash bar, playful gallery activities, and hands-on art making. In collaboration with the Boston Literary District, the Gardner invites you to make creative connects in the galleries and interact with local artists and writers. Get inspired by the Henry James and American Painting Exhibition through literary games, artistic exploration, and poetic activities using Henry James’s writing as a jumping off point.